In the heart of the city on the banks of the Rhine and easy to reach from all directions the Rheingoldhalle offers over 7,000 m² of accessible function space in 15 rooms and a maximum of flexibility. In 1884, the Stadthalle (City Hall) was opened in the very place where the Rheingoldhalle is located today. At that time it was Germany’s largest festival hall. The Stadthalle Mainz has already served as a venue for carnival celebrations and large-scale events. 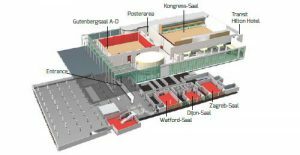 The construction work on the Rheingoldhalle officially started on the 27th of February 1966 – a date that was deliberately chosen, since it was the 21st anniversary of the Stadthalle’s destruction by World War II air raids on the city of Mainz. The completion of the Rheingoldhalle marked the last crucial phase of the reconstruction of the city centre of Mainz. Due to growing market shares, the Rheingoldhalle saw its first expansion in the mid-1980s, adding 3 new conference rooms: Dijon-Saal, Zagreb-Saal, Watford-Saal. These rooms were named after Mainz‘ first twin cities. The second major expansion followed in 1989, based on the plans by the renowned architect firm Dissing + Weitling from Copenhagen. The Rheingoldhalle was completely redesigned and became part of a building complex incorporating the city hall with direct access to the Hilton Hotel on the banks of the Rhine. This enabled Mainz to build its reputation as a national and international congress city.